A Christmas Tree from Naugler's has become a powerful tradition for many families. We ship trees into almost every state east of the Mississippi. We are closer than you think! We take pride in our balsam trees on their Unique Needle Structure, Fragrance, Hardiness and Freshness. 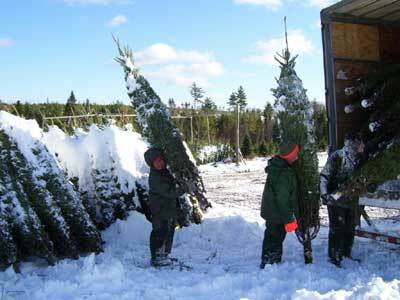 One acre of our Christmas Trees produces enough oxygen for 18 people. When in your home, our Christmas Trees will continue to give fresh oxygen, and may drink one to four quarts of water per day. At Naugler's we grow our trees in cultivated natural stands. We select only genetically superior balsam Christmas tree seedlings and whenever a tree is cut, we insure there is another tree to take its place. We are constantly scouting and monitoring our tree lots throughout the season keeping track of all insect outbreaks and insuring balance. When you purchase a tree from Naugler's you can be assured you are buying a tree that has been grown with tender loving personal care. With over 1000 acres of trees under cultivation we grow everything we sell. Our standards are high, we insure every tree cut meets our stringent grade. We believe in cutting at the latest possible date to guarantee freshness. We achieve this by using the most modern and efficient techniques to process our trees and with extensive road systems throughout our lots, we can access our trees in any kind of weather.